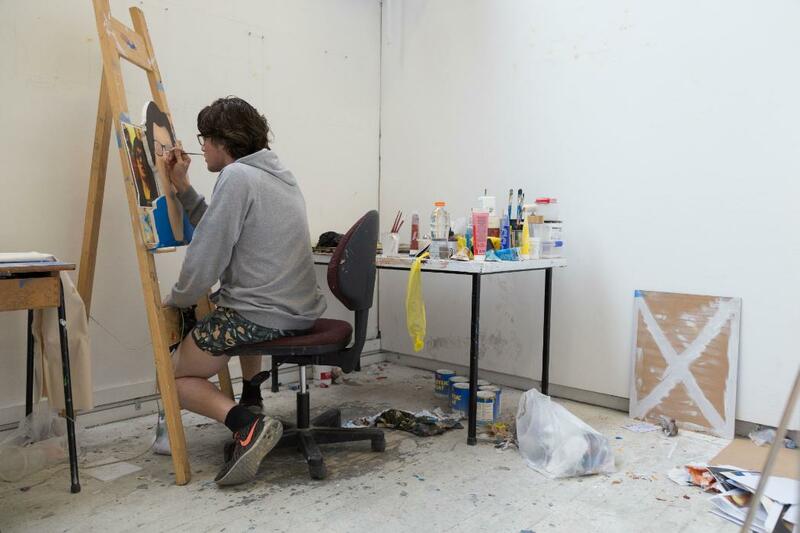 The Bachelor of Fine Arts (BFA) degree begins with an intermediate year which introduces the five specialist studio areas in the form of a series of workshops. Students must pass FINT103 to proceed to the studio courses. The Art History and Theory requirement in the BFA introduces students to a wide range of approaches to the visual arts, including the historical, critical, theoretical and philosophical. This leads students to a more analytical understanding of their own practice, provides them with skills which improve their ability to articulate their ideas, and enhances their ability to further their studies. Art History and Theory is part the School of Humanities. Students should be prepared to spend about $600 on equipment and materials during their first year. After the intermediate year students apply for specialist studio courses. In addition to the 30 points of Art History and Theory students complete in their first year, they are also required to complete a further 15 points of Art History and Theory at 200 level by the end of their level 3 studio course. Fine Arts students must also complete a further 94 points (normally from the Faculty of Arts courses schedule) - a total of 152 points outside of their studio studies - of which a further 22 points must be at 200 level. We take the view that universities are cultural leaders rather than followers of marketplace trends and economic forecasting. With this view we see it as necessary for our students to engage with graphic design practice, and with the industry it works for, in a critical way. We aim to help our students to understand contemporary practice through questioning. How to find and/or generate these questions is largely what this course is about. The discussions that come from this process, along with more traditional research strategies, form the basis of the students’ contextual understanding - an awareness of how their practice can be located within the history and trajectory of contemporary graphic design. Our ambition has been to create a studio environment that allows for and encourages practice-based investigations into graphic design. We aim to produce graduates with individual and particular areas of research. We feel lucky to be the only design programme still operating under the umbrella of a Fine Arts Degree in New Zealand. Film studies focus on the directorial and the narrative, leading to an understanding of the basic procedures of film and video production and the acquisition of basic skills. Advanced studies begin with an introduction to the procedures and skills associated with documentary production and lead to a practical consideration of issues of fiction and narrative. While the course encourages students to develop ideas and practices suited to their own creative ends, it also encourages a critical view of accepted practices and an assessment of the commercial realities of film marketing. Advancing courses in Painting begin with project work in PAIN201 specifically designed to introduce students to painting, the rationale which lies behind the medium and the basic formal issues which guide it. Advanced studies are conducted through personally constructed courses of study and founded on clearly defined teaching and learning agreements. These agreements are subject to constant monitoring by lecturers and to critical review. These agreements help students to become aware of, and to locate, the areas of their greatest interest. Students are also encouraged to develop effective and appropriate forms of critical discourse about their own work, the work of other students and of current art practice in general. Advanced courses in Sculpture (SCUL201) address issues relating to form, balance and space with reference to the body and its place in both the history and current practice of sculpture. These initial investigations are then expanded to account for technological developments in materials and their application. This base is expanded upon in the following years (SCUL301 and SCUL401) where students are encouraged to develop sound critical responses to their own practice through weekly seminars and critical exchanges with staff and other students. These courses are developed on an individual basis, founded upon teaching and learning agreements which focus on the development of sound working methods. Sculpture courses are supported by a wide range of material applications in the workshops and provide advanced technical support for students who are encouraged to develop their technical skills in the making of their work. Studies in Photography begin with a comprehensive introduction to photographic principles, an exploration of photography as a device for communicating information, ideas and personal insights, and an introduction to the basic materials and process of photographic practice. Further studies involve an examination of the procedures which are distinctive to photography and how these procedures can be used for documentary and artistic expression. Advanced studies are individually constructed, focusing on projects concerned with expressive aspects of the medium, and students are encouraged to examine their work critically and within its historical and sociological context. The BFA (Hons) course is an intensive year of study. This course involves a studio component (501) worth 75 per cent of the course requirements and a research paper (550) worth 25 per cent. The MFA can be completed in a year working full time or on a part-time basis. Entry for this degree is normally achieved by completion of a BFA (Hons) degree or its equivalent qualification and experience, one year of postgraduate study from another institution with work of a sufficiently high standard or having work and experience which meet the expectations and standards for entry to the degree. Applicants also need a proposal of work to be undertaken and examples of studio practice. See the Course Information website for more details about studying Fine Arts.